Ladakh, a part of Jammu & Kashmir State in north of India consisting of two districts Leh and Kargil.Leh is a complete beauty in itself. Leh has quite a few amazing places to offer its tourists. The most striking sight of Leh is the group of women, traditionally attired, selling fruits, vegetables and household articles, spinning and knitting, and exchanging gentle banter between themselves and with passers-by. 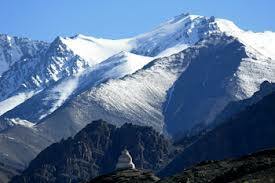 Leh is one most frequented destinations for the trekkers in India. Ladhak is the largest province in the state of Jammu and Kashmir. The landscape of Ladhak, a high altitude desert, is defined by craggy, barren cliffs and plateaus. Ladhak is a favorite among adventure sports enthusiasts, offeringunique adventures in trekking, mountaineering and white water rafting. While rafting options are available on both Indus and Zanskar rivers, the Zanskar course is more difficult and exciting. The trekking options range from short, day-long walks to visit monuments or monastic settlements to long, trans-mountain treks involving weeks of walking and camping in the wilderness. Ladakh is open for tourist throughout the year, while the best period for tour and trek is from June. The best time to visit Ladakh is from June until September, the region’s summer season.At this time, Ladakh is an unparalleled paradise, with clear, stunning views and warm and sunny weather – the average temperature range during the day is about 20–30°C. Keen trekkers usually head to Ladakh during July and August, when the Manali-Leh and Srinagar-Leh highways are open to vehicles. That said, Ladakh is a land bound by two of the world’s highest mountain ranges – the Himalayas and Karakoram – anyone visiting Ladakh, even in the middle of summer, should be prepared for the sharp drop in temperatures at night.The best time to visit Ladakh is during summers. The summers in Leh Ladakh stretch from June to September. During this period, Ladakh as well as the nearby areas experience warm and sunny days and delightful nights. For those who are interested in trekking, the peak season for Ladakh travel consists of the months of July/August. Around this time only, the passes on the Manali-Leh Highway and the Srinagar-Leh Highway become motorable and the tourist start coming soon after. The winter season is not ideal for travel to Leh Ladakh. This is because during winters, the temperature in Ladakh falls to below zero degrees often and the weather is quite cold and harsh. Also, because of heavy snowfall, the roads become unmotorable in winters.The best time to visit Ladakh is during summers.Ladakh is a land bound by two of the world’s highest mountain ranges – the Himalayas and Karakoram – anyone visiting Ladakh, even in the middle of summer, should be prepared for the sharp drop in temperatures at night.Even the natural beauty at this place is center of attraction for people. They are fascinated with lush green environment, slope hills and pleasant weather. Now this place even has direct connectivity of flights from several places of India. So when you plan for a vacation then it can be an option in your list. Leh Ladakh is famaouse as the Heaven on Earth.